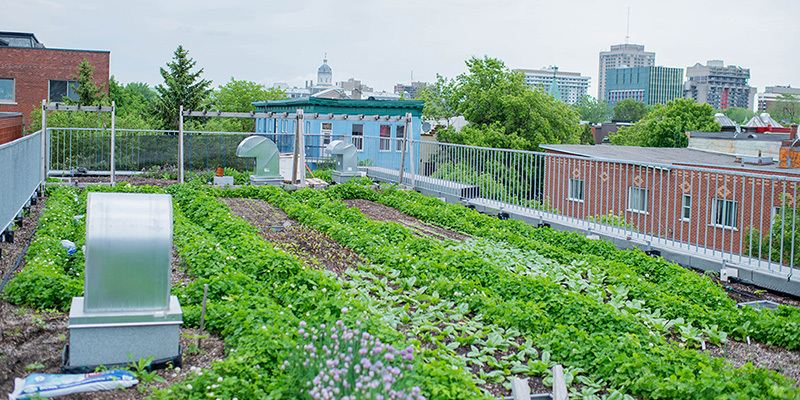 The Roulant’s rooftop garden is a hidden gem in the Plateau that we try to share as much as possible with community members, visitors, and passersby. It is part intensive rooftop garden, part terrasse container garden. The walls are covered in murals and honey bees grace us with their buzzing. The real beauty of the garden is that it is one of the three pillars of our buildings food cycle. A portion of the food grown on the roof is sent to the kitchen for our meal-on-wheels. Kitchen scraps go down to the basement to be composted by our worms and finished compost is then brought back to up to the rooftop garden. It’s by no means a closed loop but it helps reduce the distance our food travels and the amount of waste produced. 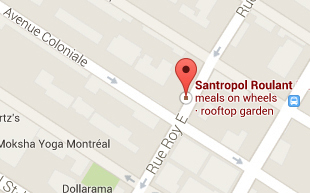 The garden is on the roof of the Roulant building at 111 Roy East, Montreal, QC H2W 1M1. How can i be a part of this!? Hi Michael, The best way to get involved is to volunteer with the urban agriculture program this summer! We will be sending out an update in our newsletter in the early spring about volunteer opportunities. If you have more questions you can email Ben, one of our volunteer coordinators, or contact Carlo, the Urban Agriculture Manager.